How can Lock/Unlock transaction codes via SM01? SM01 is a very useful transaction. 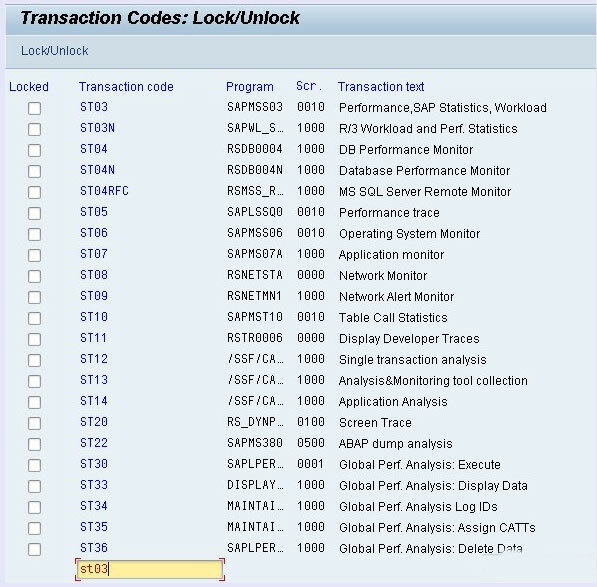 Not only can you lock transactions from being used at all in the system, but as a general SAP use it can also be used to look up transaction codes, whether for functional information or simply because you forgot which code you need! 1. In SM01, Type the T.Code which u want to lock (for example here, ST03) and press Enter do not select the Tickbox, Directly click on the tcode and press Lock/Unlock button.